Update 04/24/2015: I have been receiving a handful of inquiries as to where to find a jar similar to the one I used. This one found on amazon is very similar! Looking for an easy way to have an extra $1,378 in your pocket next Christmas for all those December expenses!!? 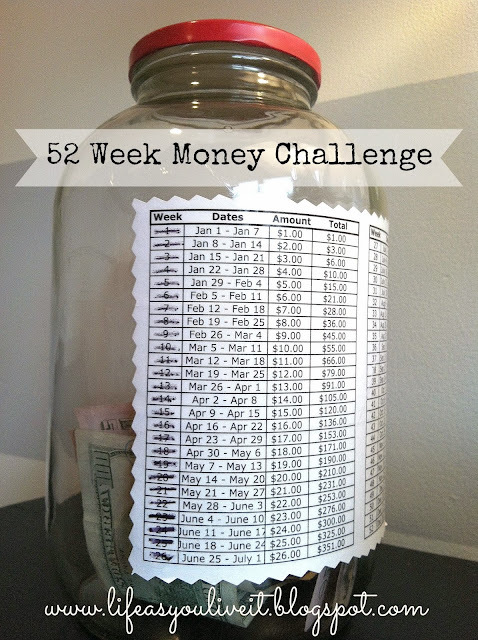 I invite you to try the 52 week money savings challenge! 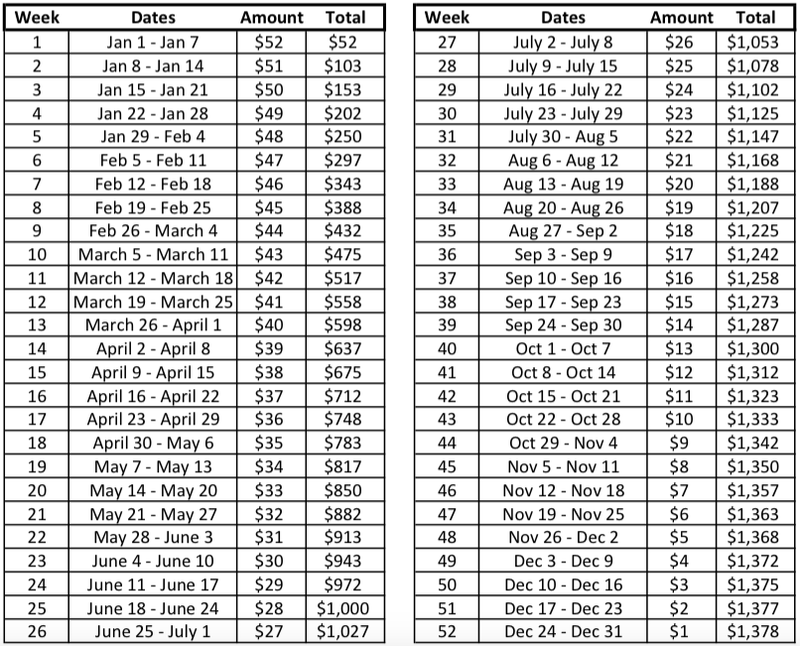 I completed this challenge this past year and was able to have plenty of money in the bank for Christmas and then some… I'm talking over $700 left over to do with what I please. It's very quite simple and extremely basic. Here's the name of the game! Each week of the year, you save that much in dollars! Voila! By the third week in January you have already saved $6! You keep doing that all the way through the end of the year so that come December you have cash in hand and are ready to shop! …ORRR… maybe you're saving for a HOUSE, a TRIP, a WEDDING, or a CAR… ANYTHING! Come and join the money savings fun with me and let me know how you do! Want to make your kids save to? Have them save in quarters, either in 25 cent or 50 cent increments! Print out these templates and paste them onto a jar! I want to save in One Dollar increments! I want to save in 50 Cent increments! I want to save in 25 Cent increments! I want to save in One dollar increments Backwards! I want to save in dollar increments bi-weekly! I want to save in dollar increments monthly! Start your savings adventure NOW! P.S. If you want to read some updates from my savings challenge last year… I have some posts here, here, and here! Hello! I just uploaded another template onto google docs. You can save in dollar increments biweekly with it. Feel free to print it off! 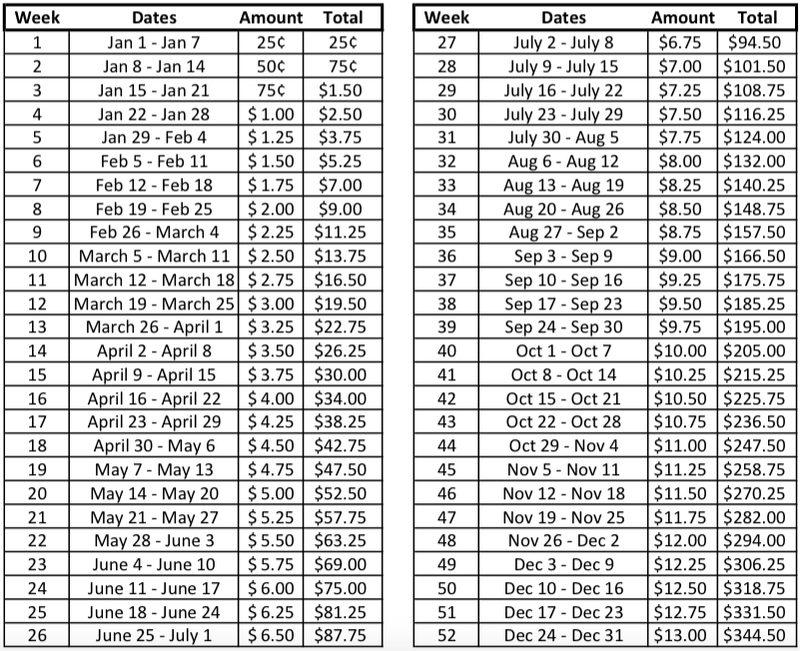 I made one that goes backwards as well if you prefer to save more money towards the beginning of the year, and less towards the end! Ok, so Iove this idea, even have my teens excited about it. However would I be a pain to ask you to do a biweekly backwards???? Print out for alternate amounts weekly? 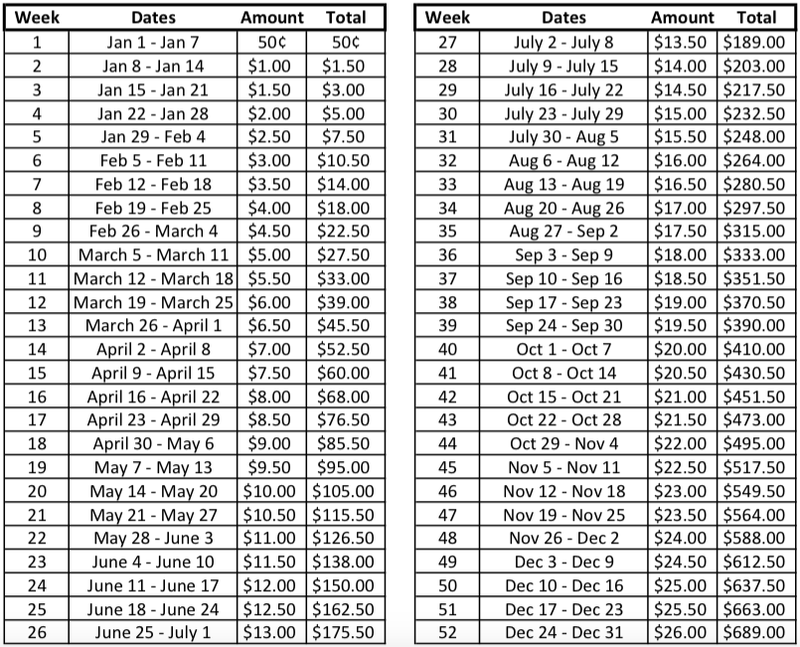 $1, $52, $2, $51, $3, $50...works out to $53 every 2 weeks...easier to budget in rather than it growing to all larger amounts at once! What a fantastic idea! Is there anyway you could send me a copy of the label on the jar to be able to track my giving? Thanks so much! I uploaded several different templates onto google docs (See links above in this post). Just select the savings template that you prefer and it should load and be printable. If you are having any issues with printing the template with google docs, please let me know. Hi! These are really good. I did notice a slight error on the biweekly template, though; it says "Dec 23 - Dec 31", when it should say "Dec 17 - Dec 31". Just one question: How big is the jar you're using? I got the jar from the cafeteria at my university, so it is a very large jar. I know stores like TJ Maxx, Wal mart, etc. have fun jars that you could use! I will certainly email them to you! Just email me letting me know which ones you would like! Hey Kay Tek, I am on Disability and only get paid Monthly can you make one for a monthly save or tell me where to go and get it.thank you. I went ahead and uploaded a monthly template for you! It is up by all the other templates! This is a fantastic idea even my daughter got interested in saving this way! Thanks for sharing! Happy New Year!! I need a Monthly saving spreadsheet for this one.. I am on Disability and only get paid Monthly.can anyone help. I added a monthly template for you! It is up by all the other templates. I have one that goes forward and backwards in dollars. Thank you for sharing these savings plans! I am blessed in receiving such a wonderful and painless ways to save and also teach this principle to my grandchildren. May you receive favor and a two fold blessing! Stopping over from Mason Jar Crafts, I might give this a whirl! Thank you for sharing it. You may have to download the template first in order to print it. If that doesn't work, feel free to email me which ones you would like and I can send them your way! Is there an updated weekly goal (dollar) for 2014? How nice, I will change the dollar onto euro for my template. Is it ok to use your picture of the jar on my (dutch) blog? Ofcourse I'll link to your blogpost. Hey Kay I love this I idea but I can't open the links do you think you can send the boo biweekly one top me in an email. Thank you so much. I look forward to your email. Hi there! looking forward to implimenting this ASAP! My kids are going to love doing this too. I am not able to download the template. could you send it to me or help me download it. When I click the link there is not a template. Thanks!!! I'm going to use one of the kid piggy bag cans that you have to use a can opener to access. I'm also changing it slightly. 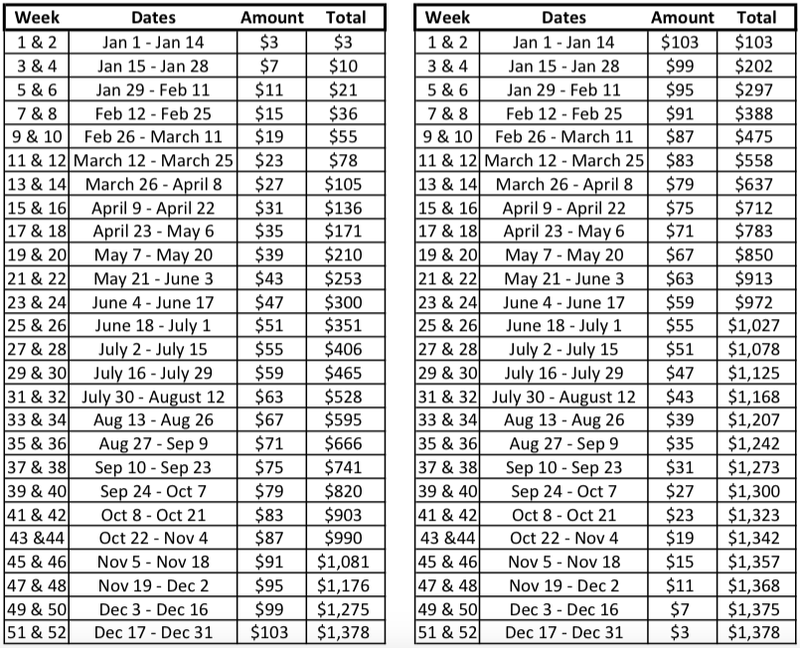 I'm choosing the dollar amount I want to have saved by the beginning of December - for me $900 is good, and then I'll change up the amounts so that I won't have a month where I'm having to save an overly large sum. My weeks 1, 2, and 3 will be the same but week 4 will be the amount I'd have to put away for week 42. Then week 5, 6 and 7 will be the same but week 8 will be what I'd save for week 41 etc. Get it? 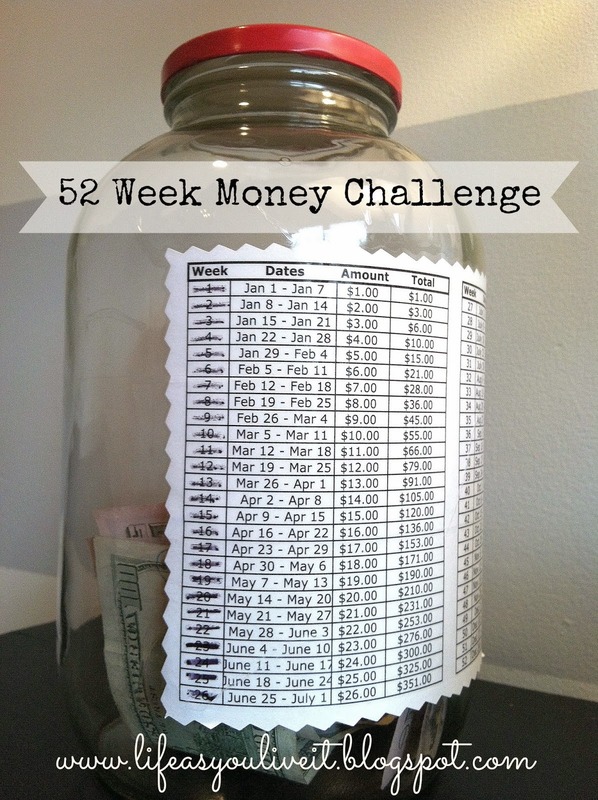 I think this is a great idea - and the quarter challenge is fantastic for kids old enough to earn money with extra chores. I'm a little concerned about those of us who might be tempted to 'borrow' from the jar (sales do happen!!). In order to encourage restraint, I just have a specific amt transferred from my checking account (monthly for me) into a Christmas club account with my bank. I don't have to remember to 'put money in the jar' and the jar isn't handy for someone to 'borrow a few bucks' now and then. I started with $100.00 so by December I'll have $1200.00. It's easy, painless, took about 15 minutes online to setup and then I'm not tempted to 'borrow'. To keep the fun in it, I have the mason jar set up with the template attached and I my drop loose change in it every day with a colorful slip of paper showing the current balance in my Christmas account. It's amazing how the loose change adds up - another $200-300 a year! It's also very adjustable for those on different income levels to adapt. Hi! Do you have one weekly for 2015 as well? Hi! Do you have one for 2015 weekly as well? You can use the same chart year after year! The day may be off by one on leap years, but other than that you should be good. Can you send me a sheet for bi-weekly saving? I just posted pictures of each of the charts for you to download and print if Google Docs does not work. Hi. Hate to bug you but I can't get the template to print, either. Tried multiple times, and although it shows up, when I try to print the page is blank..... I would like the $1 weekly form for me and the $0.50 for my kids if you could email them to me... libby.inglett@gmail.com Thanks for such a great idea! I just posted pictures of each of the charts on this post for you to download if Google Docs does not work. This so smart! I just printed one for me and one for my sister. We will be saving together! Thanks for sharing. The bi-weekly backwards chart is on the same sheet at the regular biweekly chart. I just posted pictures of the forms on this post for you to download if Google Docs does not work. Good Luck! Those links are no longer live. If the links are not working, I have just posted pictures of each of the forms on this post for you to download. Do you have a Template for Indian Rupees aswell. I just made a template based on these that are consistently around 106$ a month and it doesn't hit hard at one time in the year over others. I put the forwards on the odd weeks and the backwards on the evens and paired the amounts as well so that the backwards evens were even $ amounts and the forwards odds were the odd $ amounts. This works best for me so that I am not dishing out 200+ in any month. I am rolling! Laughed so hard at the psychology of trying 20 different savings plans. I am always looking for a better bible study plan, housecleaning plan, etc Thanks for the post! Hello and thank you for this awesome idea. I am not able to print. Can you send me the weekly & by weekly to my email address (celia.aguilera@gmail.com. Thsnk you ahead of time. Thank you so much! What a great idea. I am going to do the dollar, backwards, and have my stepdaughter do the quarter one. I can teach her how a little bit of savings really adds up. This is an awesome reminder! We used to do this when we were younger - by putting our coins into a piggy bank. Now, it's "official" with trackings! Heh, thanks for the tips and efforts on preparing those templates too! Great idea ^_^ Thank you for share! Thank for the idea.i now have 5jars for myself in different plans & 4 jars of 25cents for my kids to save on their own.i'm bad at IT stuffs,so i just screenshot the templates wz my hp & print it..n voila,it works..hahaha..thanks so much. Greatest idea..i now have 5jars for myself in different savings plan & 4jars at 25cents for my kids for them to save on their own.i'm bad at IT stuffs,so i just screenshot the templates pics wz my hp & print it...n voila,it works..hahaha..thank you sooooo much. 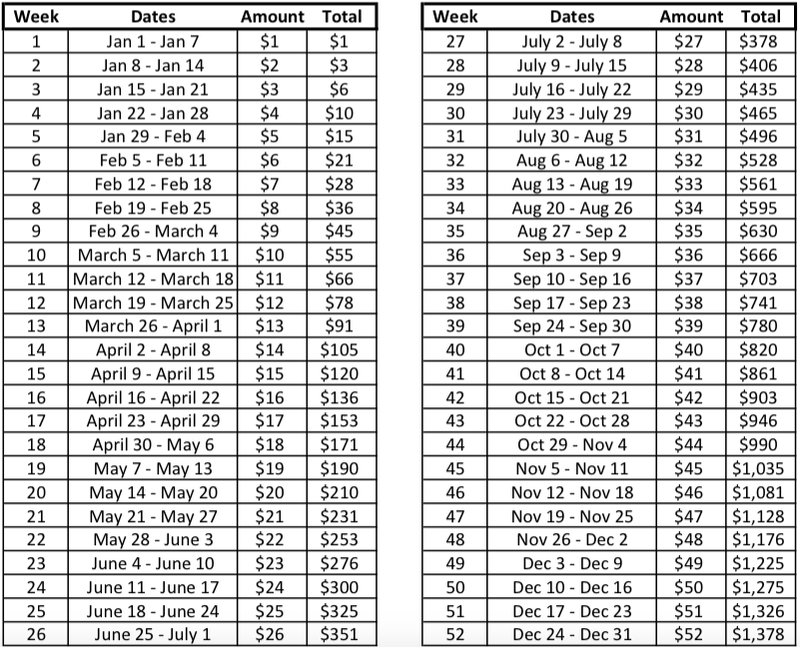 This is a great idea and will help save up for an upcoming vacation to Europe! Do you still have the template that is backwards (more now less later?) I thought I saw it but can't seem to find it here or in the google docs. Are you able to email it? Thanks in advance! Hi! Are you able to come up with a template based on the weeks of 2015? What a great idea and fun way to save money!! Thanks Kay. I'm sending this to my workmates to all try and save. My sister emailed it to me and I followed it your blog. Thank you for sharing this. I wouldn't have found it if I wouldn't have followed a link on Facebook. I wanted to jump ahead as well. Let's rise a bar a bit bit higher.. You can save every MONTH double of what you saved previous month, starting with 1$/EUR in January.. anybody willing to try? I did this this year and I will be able to go to Aruba in Feb 2016, TY soooo much!!!! Will do it again! did this this year and I will be able to go to Aruba in Feb 2016 because of it, TY sooo much and I will do it again!! (: Isabelle, thank you so much for the sweet comments!! Enjoy your trip to Aruba, you deserve it 100%! I did this last year very successfully but I changed it up a bit. I did wk 1 - $1, wk 2 - $52, wk 3 - $2, wk 4- $51 and so on...this made it easier to break up the big amounts. Thanks for the great idea though. The only bad thing I see is December will cost you about 200. I thought about what Julie Sebring suggested, but then just thought $26. A week returns the same results. Oh my gosh!!! Love this! Thank You for the templates just print then and label the 4 Jar's so excited to finish this challenge. I cannot access the charts - I've tried three times! Can you mail me the $1.00 chart and the 50 cent one? This is sensational - got the whole family thinking about saving! Awesome! That is great to hear! Good luck!! Did you glue or tape the chart to the jar? Or another way is.... Once you save $26 in the 26th Week, during the 27th Week save $26 again and work you way back down to $1 in the last week, sure this will only net $702 by the end of the year, but it'll work for people who get scared of the bigger amounts and having just over $700 by the end of the year isn't something to complain about... that could be your Christmas money OR put a dent in your debt OR just keep adding to it to watch your savings grow! Posts on LIFE AS YOU LIVE IT may contain affiliate links. All of these items are ones that I would personally (or already have purchased) purchase for myself. Opinions reflected here remain my own.